The MPR E-Scan is a rugged, industrialized, in-line process refractometer. 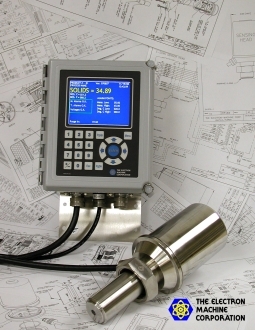 It directly measures the refractive index of process fluids and then displays the reading in any number of customer-desired units (Brix, Percent Solids, Dissolved Solids, SGU, R.I., etc.). This reading may be used as an error indicator or part of a complete process control system. A high-resolution color display and a 4-20mA output is standard. HART® protocol, RS-232, and RS-422 outputs are available. Each sensing head is custom tailored and calibrated specifically for the desired process application to ensure the most accurate and useful reading. A simple 0-10Vdc signal is used to transmit the reading from the sensing head to the electronics console, ensuring a robust reading that has a minimal chance of being effected by interference. The entire package is NEMA 4X rated and designed and manufactured with the best materials for each application to provide years of trouble-free service with a minimum amount of maintenance. The MPR E-Scan has numerous applications in the paper industry. The most common applications are on black liquor and green liquor. More information on these can be found by clicking the links below. Other applications include red liquor, white liquor, tall oil, and resin. Please contact us for more information. The MPR E-Scan has numerous applications within the chemical industry. Some of the most common are listed below. In general, the MPR E-Scan can measure the strength of a chemical when diluted with water (or another chemical). If there is a concern with optical coating, a hand-operated brush cleaner is normally the preferred method. Various material alloys are available for wetted parts and Teflon® coating is available for non-wetted parts. Our extensive experience with in-line process refractometers has resulted in numerous other successful applications. Contact us today to discuss your application. The Electron Machine Corporation developed the first in-line process refractometer more than 50 years ago when orange juice was first concentrated. Since that time, our refractometers have been successfully applied on many more applications. Our latest in-line process refractometer, the MPR E-Scan, has many features that make it very well suited to all types of industrial food processes. For more information on the most common applications, please click on one of the links below. If you have an application that is not listed, please contact us. Can Your Refractometer Handle This?